Terry Pratchett is a stalwart in the sci-fi/fantasy genres, authoring the huge Discworld series (3 dozen books! ), as well as some other stand-alone tales. For an author as well-known, beloved and prolific, you'd think I'd have read something of his by now, but nope. Well, I can finally say I've read one of his books. 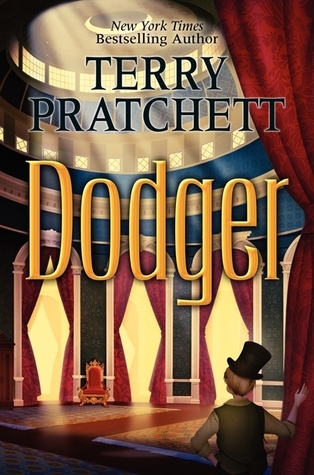 Dodger is a period piece set in early 19th century London. The titular character is a street urchin, thief and sewer rat (prowling the sewers for storm-washed coins/jewelry) who emerges from a sewer drain one night during a storm to rescue a girl who was being beaten by a pair of thugs. After saving her and seeing that she was safe, he soon discovers that he has stepped into something much bigger than he is, and is soon swept into an adventure that will require him to play detective, making full use of his rather unique streetsmart skillset. In the process, he interacts with other famous figures from London's storied past, including Charles Dickens, Sweeney Todd, Henry Mayhew and Sir Robert Peel. The story has a great feel to it, if you enjoy street slang and euphemisms, and tromping through London sewers pre-electricity, and tagging along as a dirt-poor teen infiltrates and outwits people in the highest levels of society, on a quest to solve a mystery. He also unintentionally plays the hero on several occasion, becoming well-known in a city where it's safer to remain anonymous. The language is fun, the writing in turns serviceable and exceptional. Yet... it took me a long time to finish the book. Not because it was poorly crafted or too long. Not because the characters were shallow or weren't memorable. Not because it wasn't engaging, amusing and effective. In fact, I'm not sure why it took me so long to finish. But it did. It was very easy to stop with the end of a chapter and go do something else. Perhaps it was just so quirky and/or out of my normal reading realm that a little bit was enough to satisfy me. I felt no need to tear through it, like something from Abercrombie or Lawrence. I would pick it up, enjoy a few pages, and put it down again. So how do I objectively score a book like that? It definitely fits into the category of "Books I'm Glad I Read But Likely Won't Be Reading Again." A good book that wasn't quite my cup of tea. If you're a Pratchett fan, or if you'd like to test out the waters of his style, I'd suggest picking up the free sample chapters for your Kindle and see if he connects with you. He has many books to choose from, so you might as well try Dodger. Not exactly the glowing recommendation I'm sure it deserves - but I'm not exactly the books' target audience. Summary: 3.5/5 stars. Well crafted, fun language, memorable characters, but in spite of that, it still had a difficult time clicking with me. All This and Machu Picchu Too! Black Licorice? Why, Yes, Thank You! I'm So Cool, I'm Cold! Man, These Brooms Are Sweeping the Nation!